There are two pools which are early concrete pools. 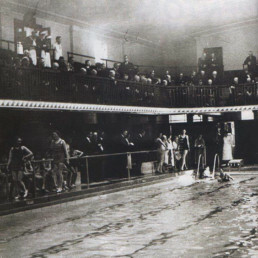 The main pool has changing rooms around the edge, a gallery with art deco style railings and wooden seating. 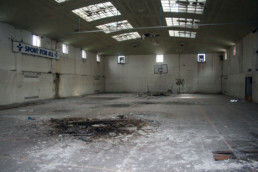 The second pool is converted to a sports hall. There is a set of 8 slipper baths and a toilet with overhead cistern. The entrance hall has terrazzo marble walls and floor. 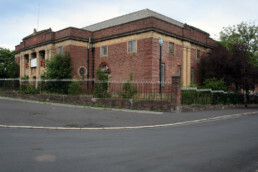 Closed since 2009, the building is in poor repair but has been saved by the local community who have set up a trust and acquired a lease through community asset transfer. When fully restored the building will provide a sports hall, community space, swimming pool, meeting rooms, community cafe and slipper baths. 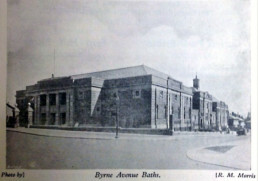 The Foundation Stone, which can be seen on the left hand corner of the front of the building, was laid on the 9 July 1931, with full pomp and ceremony by Councillor Arthur Cargill. 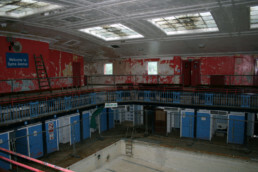 The main pool was designed to be floored over to provide space for a variety of events including cinema shows; the projection box is still in place. Floored over this main hall could hold 1,000 people. As well as traditional poolside changing cubicles there were two changing rooms for school groups. The Trust is approaching the restoration in phases. The first crowdfunding campaign has successfully raised over £20,000 to Get the Party Started! Next stages are to get the building watertight and safe, to provide energy efficient heating, to open the sports hall and community activity space and ultimately to restore and re-open the pool and slipper baths. Regular volunteer work sessions are held to keep the site clear and tidy.